Heritage by Twinings was created as a reaction to the mass-marketed and mass-produced products of modern society. It finds its roots in traditional British culture and the ceremony of teatime. 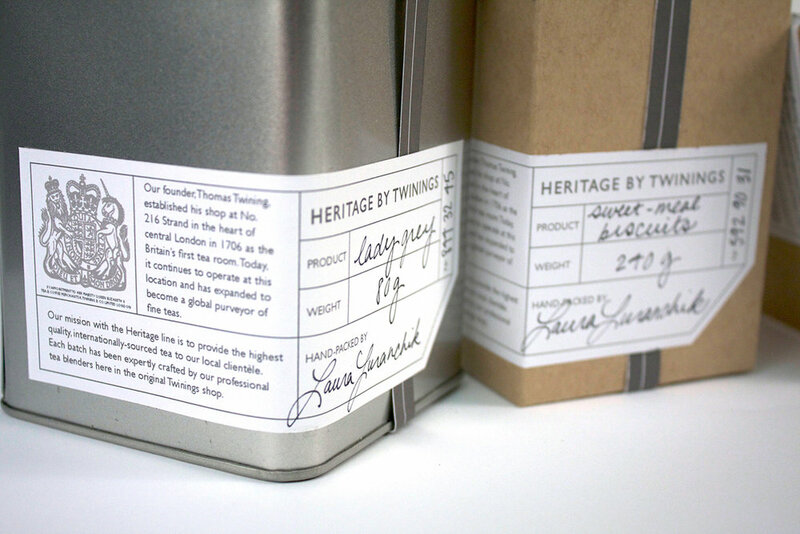 The Heritage by Twinings mark was designed specifically to work alongside the existing Twinings & Co. logo as well as on its own. Inspired by the notched tag on teabags, the branding collateral inspires conversation with it's unique shape. The most prominent feature of the packaging is the label that is filled out by hand and affixed to each piece individually by the shop. For the "We/You" Campaign, two print magazine spreads push the handcrafted nature of the products, but through the lens of the customer experience and the moments shared over tea. The cornerstone of the project is the addition of a dedicated blending studio to original Twinings shop in London. This would be a place where Guests could experience tea in it's most refined form with master tea blenders.